My former neighbor across the street, Roxanne Morrow, loves to cook and collect recipes. We swapped many recipes over the years and we came to know each other’s tastes. Roxanne knew I loved blackberries and would always set aside recipes she found that called for them. Same goes for potato salad. When I was sick, she would bring me soup. And when the flood happened, Roxanne’s heart broke too. She knew how to start replacing what I lost because she knows me so well. One treasured book lost was the beautifully bound classic cookbook by Mary and Vincent Price. Yes, that Vincent Price. He was a gourmet cook besides an actor in scary movies. It was one of the first books Roxanne asked if it survived, and when she found it hadn’t, she tracked one down. She also knew I loved all the old Betty Crocker books, Southern cooking, and found two of the Bake-Off books I was missing. But there was one vintage 1950 book that we both loved and collected: The Ford Treasury of Favorite Recipes series. A had a couple of these wonderful books and Roxanne was able to find one. The Ford-Lincoln Mercury Company used to feature in their Lincoln-Mercury Times articles about finding great restaurants and taverns around the country. 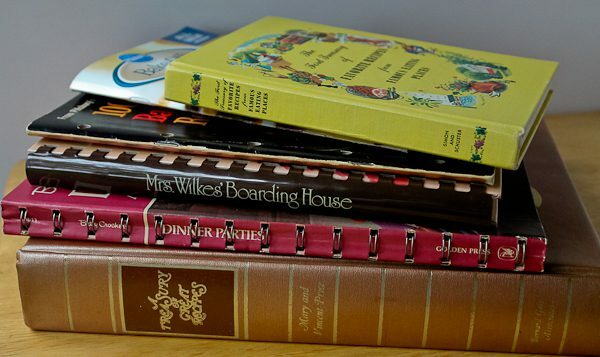 It was so popular they decided to transfer their findings into a series of popular cookbooks. The book is so fun to thumb through with great recipes from mostly long-gone American restaurants. When I told Roxanne I wanted to make something for the blog out of one of cookbooks, she asked if she could pick the recipe. Of course she could! 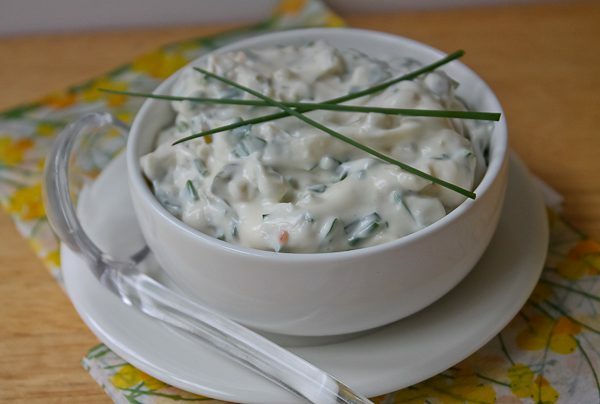 I was not surprised at the recipe she selected, tartar sauce, because Roxanne loves seafood and she loves sauces. 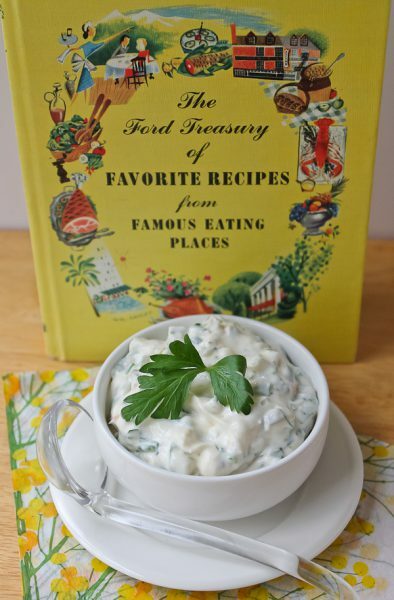 I thought she already made the world’s best tartar sauce but she said I had to try the one in the Ford cookbook. This tartar sauce comes from a favorite restaurant of Roxanne’s youth called Granger’s which was in Sabine Pass, Texas. The restaurant was for seafood lovers because the menu consisted exclusively of fish and shellfish. Roxanne said the restaurant was big on taxidermy and she remembers being fascinated by the hammerhead shark hanging above her table at dinner. The tartar sauce is outstanding. There is one ingredient that is elusive today, however. Sour pickles. Roxanne said it used to be one could buy pickles labeled specifically as “sour pickles.” I looked but couldn’t find any. Instead I had to use dill pickles twice but it was still really good. This recipe does not make a lot but could easily be doubled or more. We had our sauce last night with one of Bill’s favorites – baked wild caught Lake Superior Whitefish. 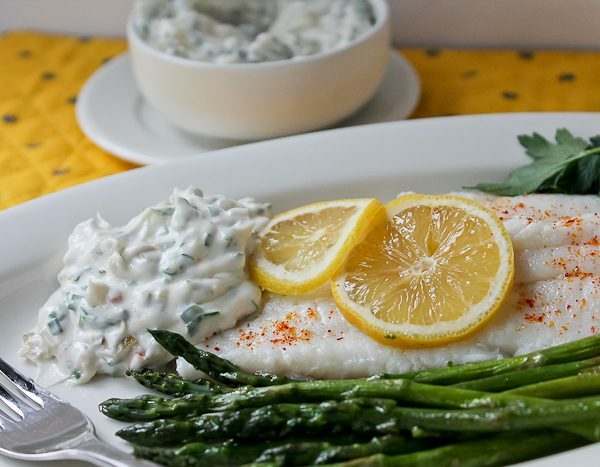 Add some asparagus and serve it all with the Granger’s tartar sauce. Yum..
Roxanne says the sauce is good if you substitute the green olives with capers too. 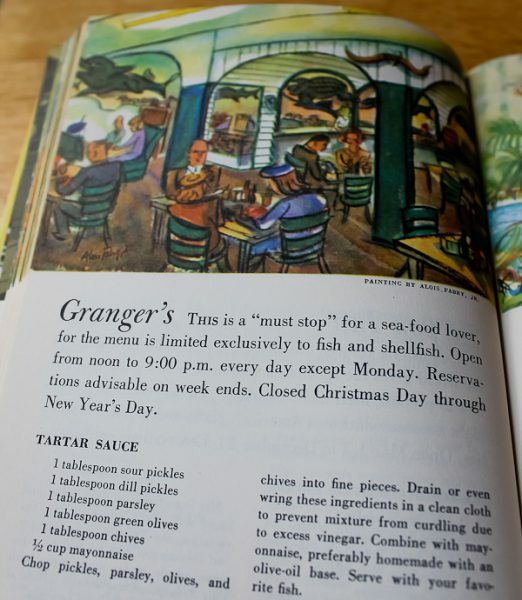 I would love it either way, but here is the original 1950’s version of Granger’s Tartar Sauce. Placing a stuffed hammerhead shark above your head is optional. Finely chop pickles, parsley, olives, and chives. Drain or wring out these ingredients to remove excess moisture and vinegar. Combine with the mayonnaise. Cover and chill until ready to use. Serve with your favorite fish. Makes about ½ cup. *Note: Sour pickles listed as such either are no longer available or hard to find. I just used more dill pickle. Roxanne, I miss you being across the street every day. Thank you very much for sharing these recipes! I admit that because I collect so many recipes, I’ve had to narrow down as to what recipes I try out! The ones posted sound really good! What a lovely story. Don’t you wish we could go back to a simpler time like Mayberry? Where everyone knew their neighbors and actually cared about each other? I remember the times in our neighborhood growing up when a mom would actually come over with measuring cup in hand asking to borrow a cup of sugar! Those days are long gone. How wonderful to have a neighbor that shares the same passion! I never knew about Vincent Price’s cookbook and this past Christmas my middle son gifted me that cookbook! He held his breath until he found that not only did I not own it but had never heard of it!! What a coup! Now I’ll be on the hun for those Ford Treasury books, how wonderful!! Lynne, isn’t the Vincent book amazing? It’s on the wish list of so many cooks. You will love the Ford Treasury books. It’s like looking back on the history of American restaurants! Fun reading and great recipes. Anither wonderful story. I saw sour pickles at one of the stores here the other day. I’ll pick up a jar and send them to you. So glad you told me, Madonna. I was beginning to think they didn’t exist anymore. Thank you! I’ll tell Roxanne they are still out there.